Another recipe from my big cook-up. I had some cooked rhubarb and went searching for a different way to use it. I found a recipe for butternut squash & rhubarb soup. 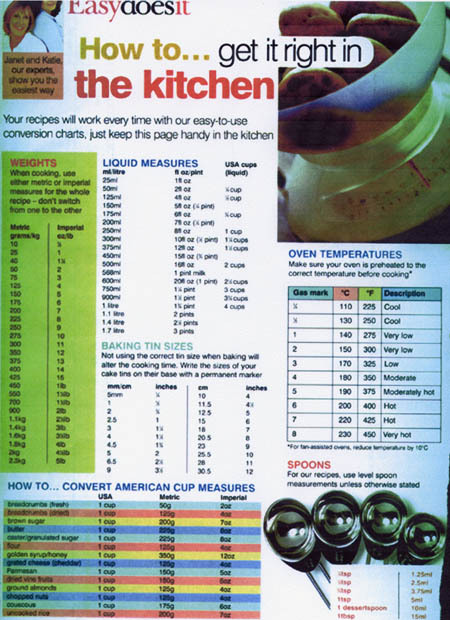 It sounded interesting but called for a pressure cooker to cook the squash and the onion…. I had ideas of my own. 1 tablespoon of chopped coriander. and white wine and stir. Add the butternut squash chunks and toss to coat in the oil mixture. Spread in a single layer on a baking tray and roast in the preheated oven for 25 minutes or until golden and soft. Remove from the oven and allow to cool slightly. While the squash is roasting, wipe and cut the rhubarb into chunks, place in an oven proof dish with 1 tablespoon of caster sugar, cover and cook on the lowest oven shelf for about 10 minutes. When cooked remove from the oven, stir to break down the chunks, cover and leave in the dish to cool slightly. When the butternut squash is cooked transfer to a large saucepan. Add the onion marmalade and the chicken stock, stir and cook on high for about 10 minutes. Remove from the heat allow to cool before liquidising in a blender. Add the pureed rhubarb and 1 tablespoon of chopped coriander. Season to taste. This entry was posted in recipes, Soups and tagged Butternut Squash & Rhubarb Soup, Recipes, Soups on October 12, 2015 by Grannymar. Food Monday – Grannymar’s Onion Jam/Marmalade. As I have told you, I had a busy few weeks cooking and preparing food for my freezer prior to my eye surgery. This recipe is a variation of my original one and prepared in typical mammy fashion: Have an idea of what you want to cook, select ingredients you have in the fridge or pantry and go for it! * I had three red (Spanish) onions, one brown and a bag of shallots. 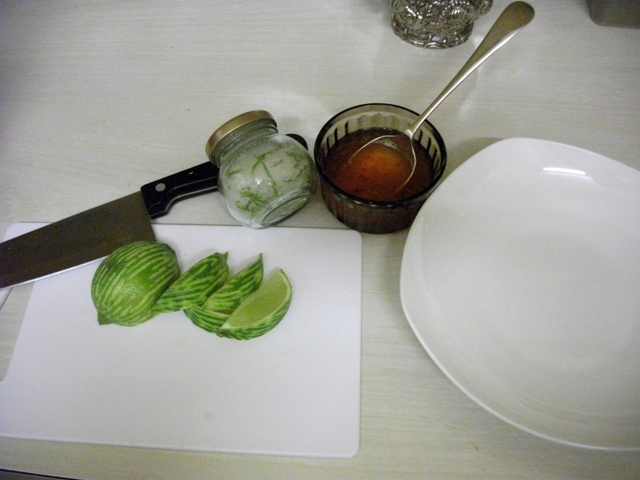 Next time, I will bung the peeled onions in a blender a pulse a few times – it will save time slicing & chopping! Heat oil in a deep pan over moderate heat, add onions and stir well. I also place a disc of greaseproof paper over the onions in the saucepan lightly pressed down as it helps them sweat and soften. Replace lid and cook gently for 10 minutes. Remove the lid and greaseproof paper, if the onions are not all soft, give them a stir and replace the greaseproof and the lid and cook for another few minutes. DO Not allow to burn. Add the remaining ingredients, stir, reduce heat to low, cover and cook for another 30 minutes. Stir from time to time to prevent sticking. Remove the lid and cook for a further 20 minutes, stirring regularly. While the onions are working their magic, wash the jars and lids and place them on their sides in a preheated oven 150°C for at least 10 minutes. Carefully remove the jars and fill with the warm onions, cover & seal. Allow to cool before storing. Elly loved it and a jar was almost emptied before she went home. Now don’t eat all of it before next week, as we need some for my next Food Monday recipe! This entry was posted in Miscellaneous, recipes and tagged food, Food Monday, Grannymar’s Onion Jam/Marmalade, Recipes on October 5, 2015 by Grannymar. At this stage, add a dash of Balsamic vinegar, cook for another 5 minutes. While the onions are working their magic, wash the jars and lids and place them on their sides in a preheated oven 150°C for at least 10 mins. Carefully remove the jars and fill with the onion mixture while still hot, cover & seal. This recipe is very versatile, it can be used with salads, cold meats or as a topping for pizza. It also works well on crackers with pre dinner drinks. This entry was posted in Appetizers & Nibbles, recipes, Vegetarian and tagged Caramelised Onion and Fennel, Recipes on November 24, 2014 by Grannymar. Yes. A very long day, but I have plenty to show for it. When I woke for the second time this morning, daylight had dawned, so I decided to win the window race. I have given in on climbing ladders outdoors, and my window cleaner was about due, so I wanted the insides sparkling. I was half way through when he arrived. At one stage we were both working on the same window pane! He on the outside and me on the inside. Was it really brighter for longer this afternoon, or was it my imagination? Who said it was only the lack of dirt? How very dare you! it was not yet 10:00 and I needed to sit down. I did. In the kitchen. Slicing Bell peppers, all nine of them in tiny pieces. 1. Nine bell peppers gave me two jars of my Slow peppers. 2. I had 1,000g of cooked beetroot, so it was grated for Beetroot Pickle. Two and a half jars of beetroot will soon disappear. It is good for lowering blood pressure! 3. Next up, I sliced onions finely for Italian Tomato sauce. Not sure if I posted that one, It is a Rufus Food & Spirits Guide special. I have filled one jar for the fridge (second right) and have more to portion and freeze as soon as it is cold. 4. The final jar above is a new one to me – Caramelised onion and fennel, it came with the Italian Tomato sauce above. I had a wee taste. Yummy. I am a big fennel fan – raw in a salad, roasted and now in this new dish. This entry was posted in recipes and tagged Recipes on November 19, 2014 by Grannymar. I had two bags on the back seat of the car, so I said I would bring them in with me and leave the rest for later, safely locked in my boot/trunk. One of the bags on the back seat had been driving me crazy for the past couple of hours of my journey, so much so, that I nearly pulled off the road to devour a fresh loaf of Veda bread, a malted bread sold in Northern Ireland. 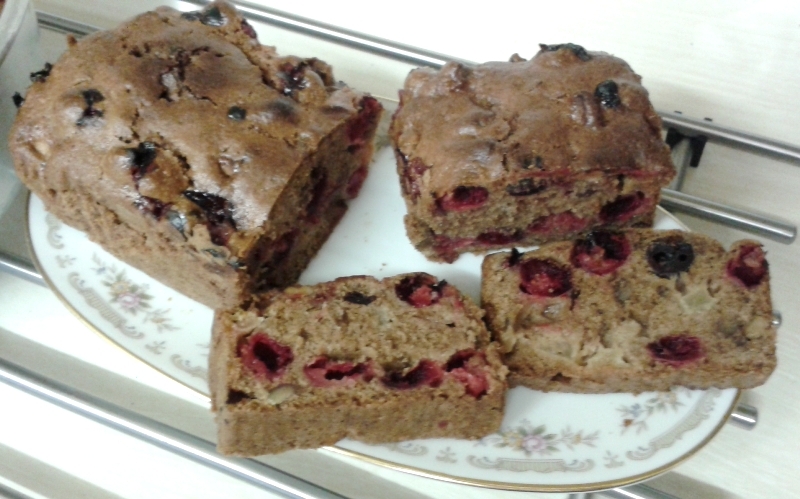 In another cake box was a still warm experiment (cake)* that I had made that morning. I needed to open the box and allow it to cool properly for an hour. So, I was welcomed indoors. Before I had reached the kitchen with the goodies, yer wan, the landlady, says to me: “I have a job for you”. “I HAVE A JOB FOR YOU!” ???? There was I thinking I was on my holidays. I’m telling you, I nearly took my three loves of Veda bread and one hot cake back to the car to find another guest house for the duration. But the other residents pleaded with me to stay. They danced rings round me and told me not to go. So I took pity on them and stayed. Over the very welcome cup of coffee, which came with Danish pastries, I was told about the job in store for me. 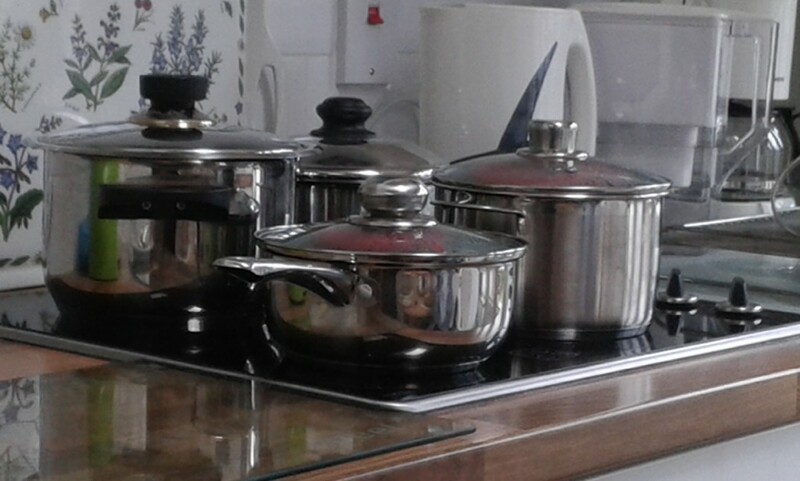 On one side of the kitchen was the greatest collection of saucepans/pots lined up in a row. On the opposite side were eight bowls standing like soldiers on parade, lined up from the largest to smallest. It almost looked like a factory production line. The largest bowl was covered and I realised it had a wooden spoon under that cover, my beady eye saw the handle sticking out. I also noted the new box of greaseproof paper, a scissors and a large ball of string and a bottle of Guinness! Now, being the month of June and not yet the longest day of the year, I was a little confused. Had my long drive brought me forward in time as well as miles? It could not be October already – The sun was shining! A mighty army of pots, boiling kettles, bowls and the other paraphernalia could mean one thing: Puddings. 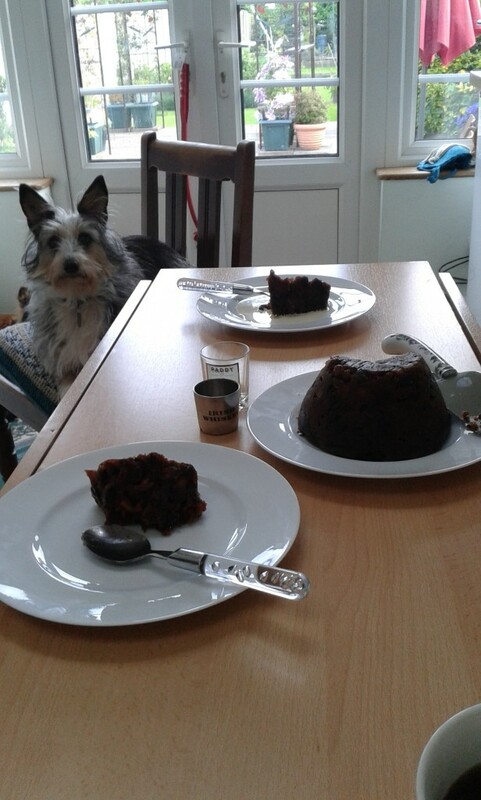 Christmas puddings. I gave the mix a stir and said: A pudding mixture should be much softer than a cake, so pour in about a third of that bottle of Guinness and we will see how it feels. Remember, any remaining stout is for the cook! She poured and I mixed, I let her have a go so she would get the feel of it. We added a little more, not as much as last time and it was right for our quantities. Eileen was using double the ingredients of mine in the link above. We filled the seven greased bowls (she worked, I supervised) leaving space for expansion. I showed her how to prepare the greaseproof covers with pleats in, and how to tie them well before adding a handle. Fair dues to the sister, making puddings on a warm sunny day was not so daft after all. The windows and doors were all open and the extractor fan did the rest. It was possible to put them on to boil, set a timer and go off to enjoy the garden. By dinnertime, four of the pots were ready to come off. The baby one, read tester, was ready to eat for dessert – part of mammy’s tradition. The other three would be cooked early the next morning. And all would be given another boiling closer to the day they were needed. 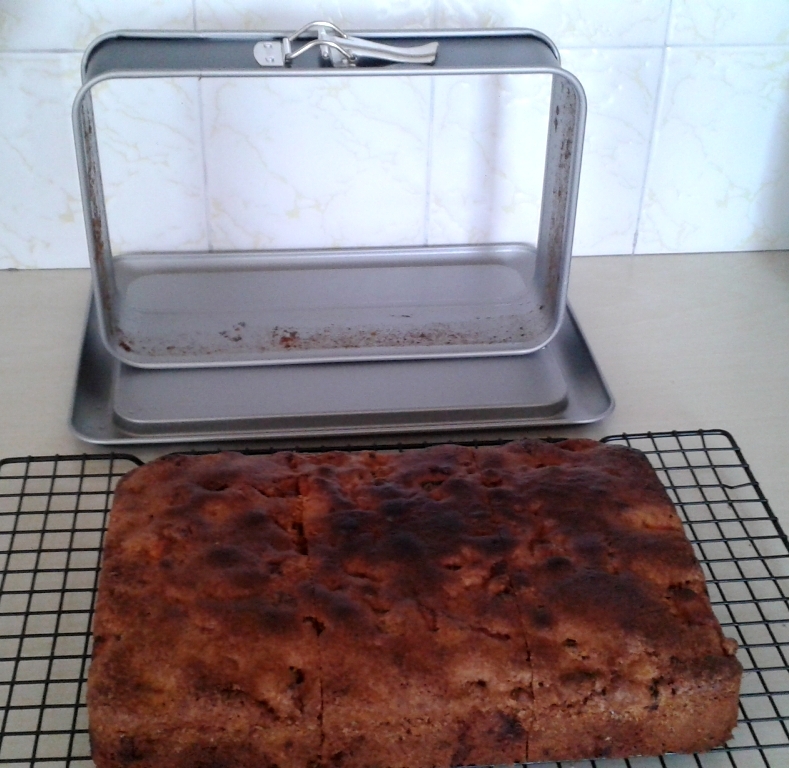 * The cake experiment was a variation on my Lemon drizzle cake. You can find that recipe under cakes in the Recipe page up in the Header Bar. This time, I made the mix as normal and when putting it into the baking tin, I dotted small spoonfuls of lemon curd randomly between the cake mixture. 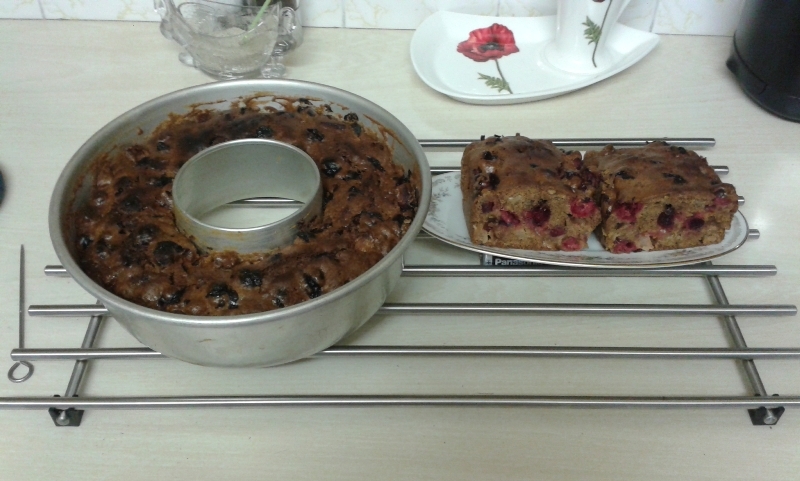 This entry was posted in Family, Food, Fun, recipes and tagged Family, Fun, Lemon Drizzle Cake, Nana’s Christmas Pudding (No suet), Recipes on June 18, 2014 by Grannymar. 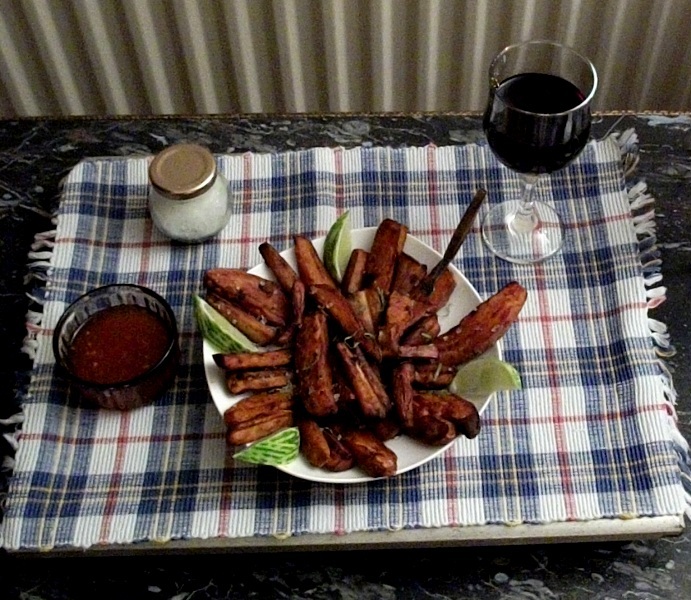 This entry was posted in recipes and tagged Lime Salt, Recipes, Spirit Lights the way, Sweet Chilli sauce, Sweet Potato Fries on January 6, 2014 by Grannymar.